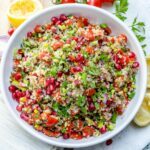 A family favorite tabbouleh salad recipe made with quinoa and pomegranate seeds. A whole new flavor of tabbouleh that's taken to the next level with the addition of pomegranates. Chop Parsley, green onions, tomatoes, purple onion, and place in a bowl. Add salt, pepper, lemon juice, Pomegranate molasses, and olive oil. Mix well until combined. Serve and enjoy. Either Purple onion or white onion will do. I like purple more. I use a small onion for 4-6 servings and a medium-sized onion if making a huge bowl.